Day one of filming is all about the “before” aspect of the show. We started out with the second thing that will appear in our episode, our tour of the space with Emily. It was so weird to have so many people in our house staring at us. All the cameras and lights and gear made us feel like we were on a set, not in our home. The bathroom was taken over by the makeup crew and the office was turned into gear central. It was so strange to feel like a guest in my own home. The next part we filmed was the interviews. My husband and I sat side by side on a pair of stools in our living room with the director right beside the camera asking us questions about the room, what we liked and disliked, and what we hoped to see in the space. We had to answer in complete sentences and restate the question in our answer. For example, if she asked us, “What are your dogs’ names?” we had to say something like, “Our dogs’ names are Ruby and Jackson.” It was hard to remember to do this and we had to repeat ourselves a lot so we got it right. After Emily was done with her interviews (we had to wait outside during this part so we didn’t hear what she said), we headed outside to the sidewalk to do the “meet the family” portion of the show. From what I understand, this will air first, though I must admit, I’m really confused how it will all fit together. We didn’t walk down the sidewalk in front of our own house because the sidewalk in front of our house is all kinds of screwed up from the huge trees that grow there. 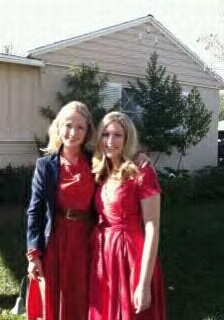 It was pretty funny that Emily and I both showed up wearing red dresses. Don’t we look like sisters? 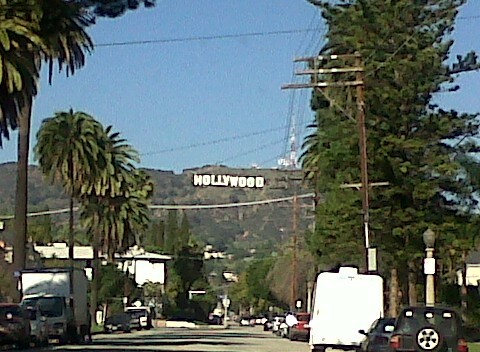 Hollywood is much cooler than the area where we live. However, the house the production company had rented as their studio space had heated up like a furnace with all the lighting and equipment. Even with the AC on, the room we were being filmed in was easily over 90 degrees. When I get hot, I get really red. I had managed to keep my red-faced tendencies under control the whole day up until this point, but it was too much for my translucent skin to bear. My husband told me that I didn’t get all blotchy like I sometimes do, just flushed. Thank goodness for that. The studio space was used to film the “style diagnostic” portion of the show. Emily had some visual and verbal questions prepared for us to answer so she could get a better sense of our styles and how that would translate into our room. It was pretty fun and I’m not too surprised with the styles she diagnosed us with. I’m not going to give anything away, but I will tell you that she is doing my style layer for the first reveal, which is filmed tomorrow. This did surprise me because I thought for sure that my husband’s style would be first. I am really nervous for tomorrow. This whole being on TV thing is much harder than I thought it would be. I feel so much pressure to do it “right” even though I know I’m just supposed to be natural. It is fun, though, and a whole lot better than work! 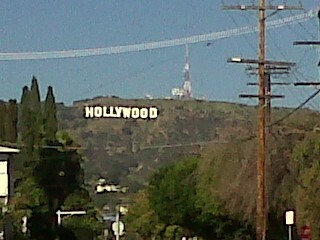 *Sorry for the blurry phone pics. I didn’t bring the camera. So cool!! We are super excited to read all about this! And then to watch it!!! SWEET!!!! Woo Hoo!!!! That sounds soo fun. I can't wait to hear more. This is so exciting! I can't wait to see the episode; it will be so much fun after reading all the behind the scenes fun.